The 1940’s could be considered the summit of George R. Stewart’s creative work. He had written landmark works before the 40’s – Ordeal By Hunger in particular – and he would write landmark works after. 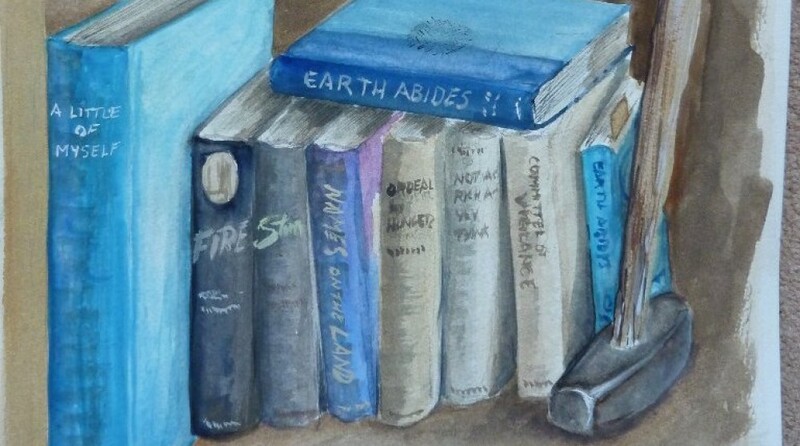 But it was in the 1940’s that he created a new kind of fiction – the ecological novel – and a new type of history – the national place names book. He would also be internationally recognized for his work, by people as diverse as authors Wallace Stegner and John Steinbeck, radio detective show writer Anthony Boucher , and Walt Disney. But the new novel would define the man and his work. In the Donner Party history, Ordeal By Hunger, George R. Stewart had created the Whole Earth vision, and shared it with millions of readers. Now, in his next book, he would refine and expand that idea, creating a new kind of novel with a new – yet ancient – type of protagonist. 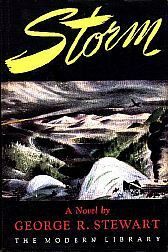 Stewart did not set out to create a new type of literature in this, his third novel. On sabbatical in Mexico, he saw a number of stories in the Mexican papers about great storms in California, and decided that a novel about a California storm would thus be a good seller. His original idea was to strand a number of humans in a hotel near Donner Pass – a story not unlike that of the Donners, but hopefully without cannibalism — and to explore how the isolation affected their interactions. But as he wrote the book, his idea changed. He realized that since it was the storm which affected the humans’ relationships, the storm was the key protagonist in the book. Once he’d had that insight – or epiphany – the entire novel changed. It moved out of the hotel, into several locations at or near Donner Pass; and it became the biography of the storm. Much of the book is set at or near Donner Pass and U.S. 40, so if you’ve traveled that way you’ll be familiar with many of his settings. The GeoS Pilgrim, Steve Williams, visited the area and photographed it so he could convince his British father-in-law that the snow really could be several yards deep. 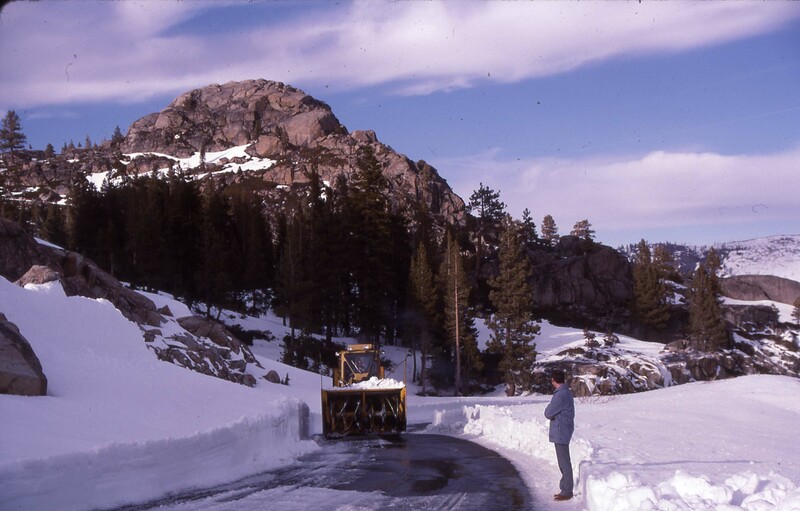 Steve Williams, the Pilgrim, at Donner Pass on old U.S. 40. March 18th, 1986. Stewart developed some unique literary devices for his book. He would intermix history, names, geographic features, and so on, with the various narratives of the characters affected by the storm. Those asides would be set apart, as if presented by a Greek chorus, thus giving the effect of a God-like overview of the life of the storm, and weather in general. His interweaving of all these different types of writing was done masterfully; his human stories were involving; and his presentation of an ecosystem event, a storm, as principal protagonist, revolutionary. It is the first ecological novel. Since it was a best-seller, Book-of-the-Month Club selection, and eventually filmed, millions had the experience of considering human drama and events from the book’s revolutionary new perspective – the Ecosystem view of human experience. As with Ordeal By Hunger, the book taught emphasized a sea change in ideas. The world was no longer the stage on which men and women played; it was the major player in any human story. Human character was determined by how people react to ecosystem events. Readers of STORM were internalizing those ideas. It clearly influenced other artists. Walt Disney filmed it for tv. Disney then hired Stewart as a consultant, to work on some film ideas about American folklore. The folklore films don’t seem to reflect Stewart’s ideas; but Disney soon after began to make his classic True-Life Adventure nature films, the godparents of all subsequent nature films. The great popularity of the novel, and of similar works by Stewart that followed in the 1940s and 1950s, lead me to believe that this book and its siblings are a major reason we had an awakening of environmental consciousness in the 1960s and beyond. It was the catalyst for the widespread acceptance of the ecological view of human drama and events. The book has been reprinted several times, most recently as a California Legacy book. It’s still a good read. I highly suggest that you visit your local bookstore – a used bookstore should be fine – buy a copy and read this, the First Book of the Environmental Movement.